A young and disoriented British soldier is accidentally abandoned by his unit following a riot on the deadly streets of Belfast in 1971. I’ve seen a couple of outstanding films recently, and following in the footsteps of ‘Gone Girl‘ comes this superbly tense thriller set in Belfast at the height of the Troubles in 1971 (hence the title). 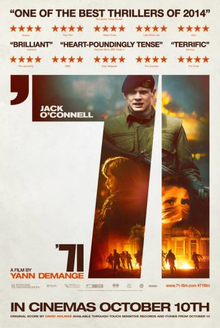 It’s an astounding piece of work from first time film director Yann Demange, and he does a remarkable job to tell this story without taking sides, no mean feat given the heightened emotions this topic still raises amongst the people of Northern Ireland and the rest of the United Kingdom today. The story follows British army rookie Gary Hook (an excellent Jack O’Connell), who is thrown into the deep end with his unit in a Catholic area of Belfast, and is accidentally left behind when a riot breaks out. The film works on several levels, and it’s testament to Demange and Jack O’Connell’s visceral performance that it’s a success on all counts. Firstly, this is a story about the violence and trouble in Northern Ireland during the 1970’s, and it portrays people on both sides of the religious divide (and in the army) positively and negatively, treating them as people with individual motives and beliefs, and not as cyphers. Secondly, the film works as a thrilling chase movie, as O’Connell’s Hook tries to escape from the locals who want to kill him, whilst never being sure who to trust out of the various people he comes across. We see the story from the point of view of the hunters and the hunted, as well as the families and acquaintances that surround them, and it gives a deeply rounded picture of a horrible situation with no winners and only losers. Jack O’Connell is outstanding in the lead role, and he’s fast becoming a young actor well worth watching. There aren’t many actors of his age capable of commanding the screen so powerfully, and after another winning role in ‘Starred Up‘ earlier this year, this is another terrific lead performance. The supporting cast is led well by strong character actors such as David Wilmot and Sean Harris (always excellent in everything I’ve seen him in), and the young performers add heart to some of the smaller roles throughout. ’71 is a terrific action film with great performances and a powerful story to tell through its taut, tense script, and I recommend it highly.